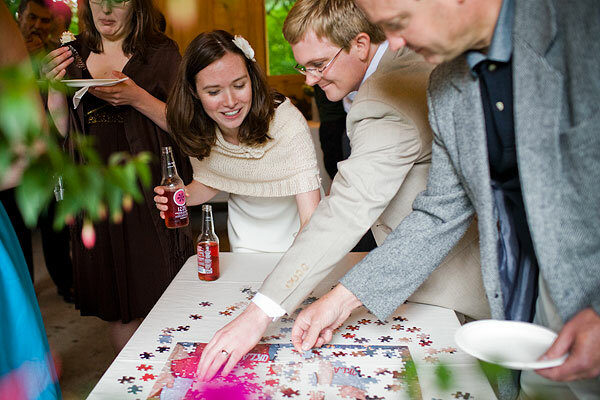 Although I repeatedly told Emily that she was getting married in JUNE, she insisted that it might be cold the day of the wedding (something about weather in the Gorge being unpredictable, or some such Pacific Northwesterner nonsense). Seeing as it was her wedding, though, I conceded that maybe she would need a coverup, which led to the inevitable desire to knit her something to wear. This desire came mostly from love, but, I’ll admit it, there was a little bit of wanting the bride to wear something I made on the wedding day. That way, when she looks back at pictures of the wedding wearing the coverup I gave her, she will be forced to think about me just a little bit. I know, it’s selfish. But it was mostly love, like I said. 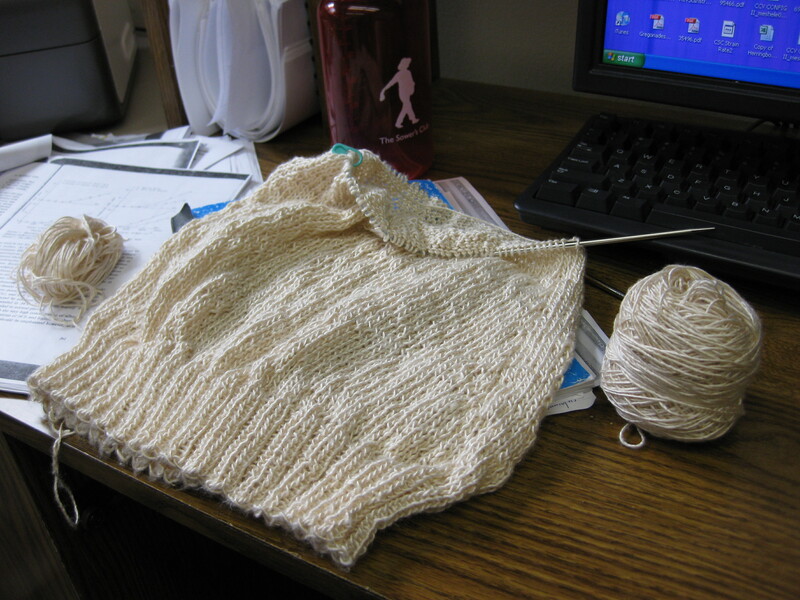 After perusing shawl, wrap, shrug, etc., etc., patterns on Ravelry, and after one dress change-up, Emily settled on Aimee, a cute little capelet by Kim Hargreaves. (You may remember me discussing it a little bit here.) There was one issue with this pattern, however – it calls for Rowan Kidsilk Aura, which, unfortunately for Emily, contains mohair. 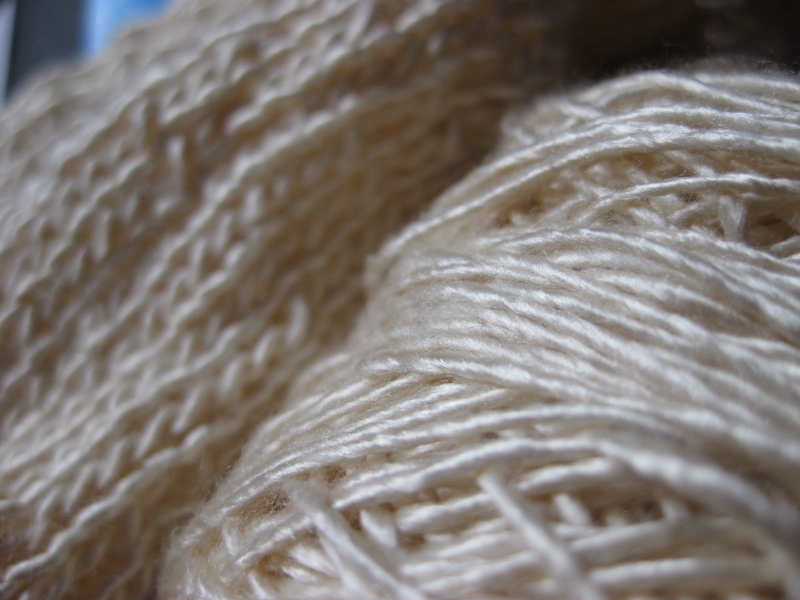 Mohair just cannot be abided by Emily’s skin, so a substitute had to be found. This led us to Debbie Bliss Pure Silk, which, as the name suggests, is 100% silk. And, fortunately, 100% of knitters named Emily, Linden and Kristen think it feels exactly like a cloud. It was love at first touch, and we ran gleefully from the store with 500 meters of silk. The capelet construction is simple, with decreases to shape the shoulders and a long cowl neck. The pattern calls for you to knit the garment in two pieces, but I decided to go for knitting in the round (my motto: when in doubt, minimize purling). I also modified the neck by working a few rows of seed stitch before binding off. 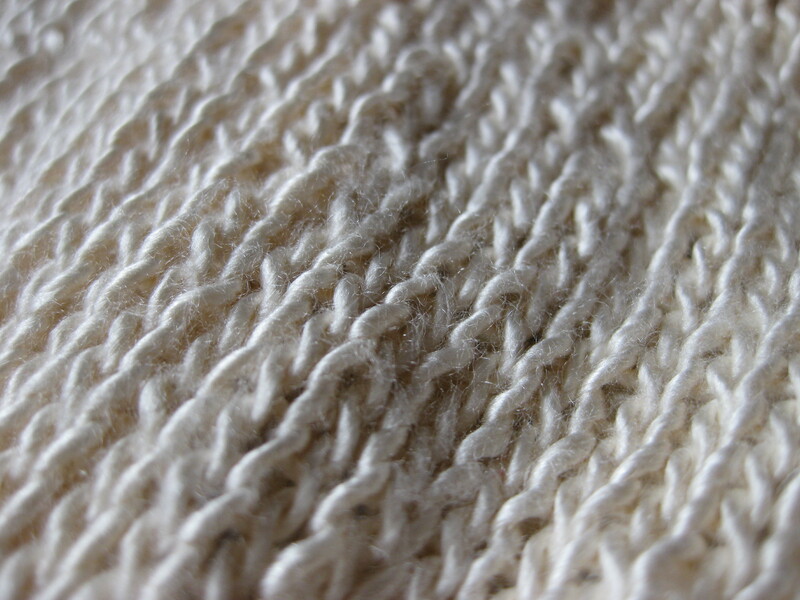 In the silk yarn the purl bumps looked like little pearls, which I thought was very pretty. Emily is very found of flowers, so we decided to take on some more knitted embellishments in the form of silk flowers from Nikki Epstein’s Knitted Flowers. (I also talked about making the decision about the flowers here.) In the end, we went with four buttercups on the shoulder (two knitted by me, one by Emily, and one by Kristen – aww). It did turn out to be quite cold on June 7, 2009. 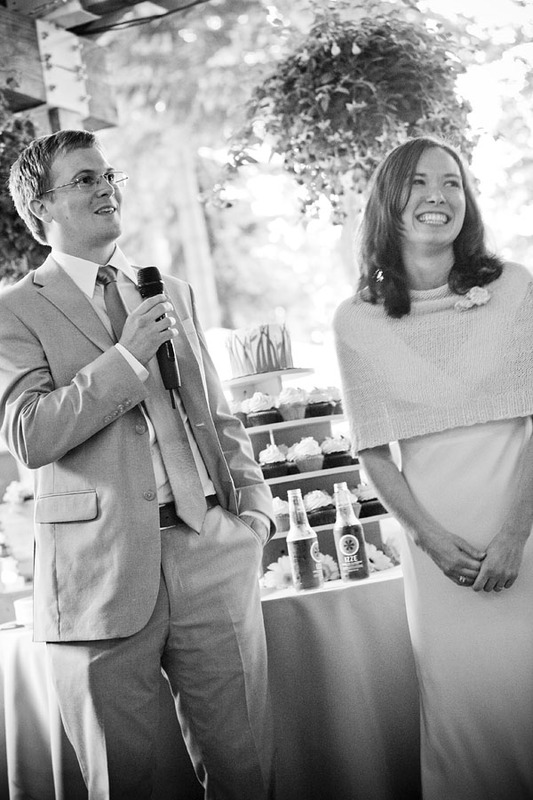 Please enjoy these beautiful photos of Emily in her capelet that I stole from her wedding photographer, Lauren Brooks. 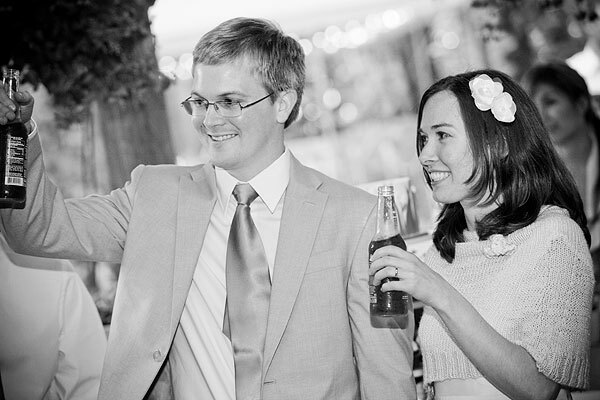 If you want to see more photos from the wedding, please visit Lauren’s blog. Well, that doesn’t have the same ring to it as “April showers bring May flowers,” but that’s what I was going for. Emily is getting married June 7, 2009. That is 80 days away. A more helpful unit of measure – the wedding is 1943 hours away (and, sadly, not all of these hours can be spent knitting). That means I’ve got to get a move on if I’m going to finish Emily’s wedding cover-up plus a secret wedding present. The cover-up . . .
I’m knitting Kim Hargreaves’ Aimee for Emily to wear over her dress in the event of cold weather (which Emily thinks is quite likely). Emily and Eric are getting married in Oregon, and I’m told that we may need galoshes for the ceremony! Hopefully the weather is nice, but we need to plan just in case. I’m making this . . . (is it a poncho? it doesn’t really seem like a poncho but I don’t know what else to call it) . . . we’ll call it a capelet (eventhough it isn’t really that either) . . . out of Debbie Bliss Pure Silk in color 03. Emily’s not too much into the fuzzy yarns, so we thought silk would do nicely for a wedding! The plan is to add a bunch of these flowers (sorry to you non-Ravelers, I couldn’t find another picture) from Nicky Epstein’s Knitted Flowers to the neck and shoulders. Oooh, it’s going to be so pretty! Ok, now the secret wedding present . . .
You didn’t think I would actually say what it was here?! Where Emily might read it any time she wants to?! Nope, I actually need ideas right now. I’ve got a few things that I’m stewing over, but I’d welcome any suggestions. And please, don’t worry about the timeline – I’ve got 1943 hours and you can knit anything with that much time. Right?